Of course my short answer is that it depends on many factors that you did not disclose in your communication. For starters, we need to clearly define “better” since each type system has plusses and minuses (some of which are perceptual and others real) that can impact their final evaluation. Another is desired outcomes. Do you demand a high gloss (wet look) floor? If so, you may choose to go with the traditional pad system that requires layers of floor finish, scrubbing, stripping, recoating, buffing/burnishing that results in a lot of DLH (direct labor hours) over a year’s time. If you can live with a matte finish or low luster then you may choose to try the diamond pad system that seems to be growing in popularity due to environmental concerns as well as total labor expended (think annual labor). The floor surface (vinyl composite tile, terrazzo, marble, synthetic floors?) can have an impact on your choice as well. Some respond differently to different systems and only testing, trial and error and keeping thorough records can help you come to a final conclusion as to what works best for you in your environment. 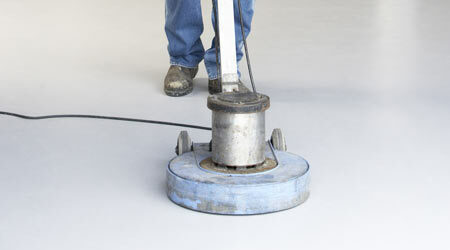 An example is that if traditional floor finishes are used on terrazzo or marble, they can cause them to deteriorate over time since they do not allow them to “breathe.” Both of these floor surfaces might be good candidates for a diamond pad system if the correct conditioners are used with the correct pad system. Usually diamond pad systems appear to be slower but when all the labor involved in traditional maintenance in taken into account, they can be for more productive and far lower in total labor costs. Remember that it is NOT the cost of the chemicals, pads or even equipment that drives your cost; rather it is total labor and benefits. Your comments and questions are important. I hope to hear from you soon. Until then, keep it clean…..